Kettler presents an ideal training machine for whole body training with the Kettler Axos Rower. Either beginner or leisure sportsman - the sturdy construction, which can be loaded up to 130 kg, provides a safe and comfortable rowing. Choose manually between 8 resistance levels to set the required resistance. The magnetic brake and cable pull provide a concentric course of movement. "Wow, that's what I already did!" The clear LCD display shows directly your training success and all required data, i.e., time, distance, and stroke rate. Pulse is measured with the optional CARDIO PULSE SET. A comfortable, silent drive and a well upholstered seat bring more fun to the workout. 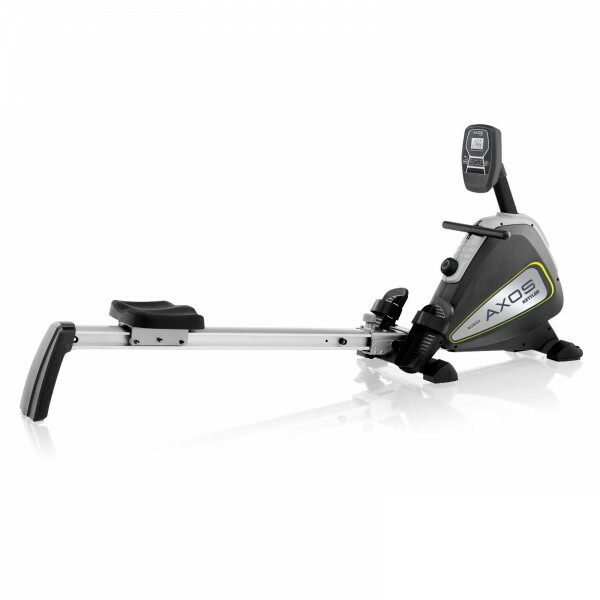 After the workout, the Axos Rower can be easily folded and stored. Ideal for every household. Hyvältä vaikuttaa. 2 viikon käytön jälkeen ei ongelmia. On tarpeeksi pitkä liukukisko 194cm käyttäjälle. Helppo koota. Bel prodotto solido e facile da montare. Ottimo vogatore ,servizio e assistenza eccezzionali sono molto soddisfatto grazie di tutto.